From canvas to skin,the evolution of art has seen various materials,various backgrounds.With body piercing now being the rage among today’s youth ,we witness the penetration of art in fashion and also a form of art youngsters appreciate.The purpose of body art goes deeper than being just an accessory. To youngsters,it is a glamorous way to show rebelliousness,to defy convention and fundamentally, to express themselves creatively. When it comes to body piercing hygiene, becomes essential.Make sure your needle is clean,sterilized and free from microbes.For this purpose,the autoclave is used where the instrument is exposed to steam and high pressure.Autoclave bags,in which the tattoo needles are stored,should be opened right in front of the customer so that they know that the needles have not been used before.After the tattooing process,the needles should be impeccably cleaned with ultra-sonic solutions to remove any residues of ink. You can use either black or colored ink for your tattoo.If you need a subdued shade of the color,the needle is dipped in sterile water and the colour concentration is diluted.For example,a 50-50 mixture of water and black ink will give you a decent shade of gray.Some artists have these colors mixed well ahead of time, so that their customer can instantly choose the desired shade and the artist can get down to business.Witch hazel,90 per cent rubbing alcohol and also white ink may also be used as diluting agents and substitute water for a more professional effect. For creating a mixture of good consistency,pour the ink into a cup. Then add the diluting agent to lighten the hue.Shake well, for uniformity and evenness of colour. Finally, test the blend by pouring it out on a clean towel. The colour should have no streaks or variation. 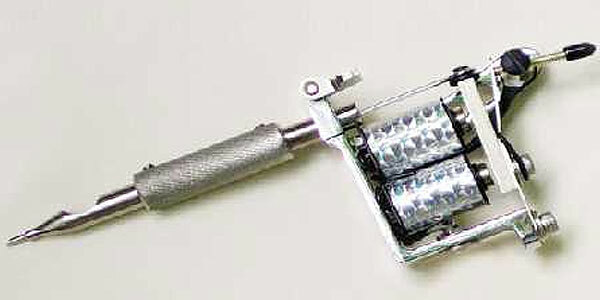 A lubricant must be used on the area to be tattooed, for smooth shading.For a professionally artistic effect, the machine should be used like a paintbrush on the body.Hence,for a deeper shade,the instrument should focus on the particular area, comparable to writing forcefully using a pen and for a lighter shade,it should simply, brush through. The depth to which you inject the needle is of utmost importance for it decides the shade of the colour.Clearly, darker shades require more depth and subtler hues demand very slight injection. Usually, the needle is not injected beyond 1 mm,that is finding its way past the epidermis into the underlying dermis.If it is any less than 1 mm, it will leave marks and fade away. Any deeper than a millimeter, the process would be extremely painful and cause a great deal of bleeding. The tattooed body part should be washed of any excess ink using sanitary wipes or professional solutions.Tattoo artists would usually tie a bandage or cling wrap around the tattoo.After the bandage is removed,anti-bacterial ointment, such as neosporin may be used. Tattoo goo may also be used. Petroleum jelly should not be used as it will only make the tattoo wishy-washy. A shaded tattoo may be accentuated with white ink.Besides serving the purpose of highlights,white ink can also be used to draw the demarcation between two shaded areas.It is interesting to note that the white ink is UV. It glows under black light. The only problem is that the white ink does not last long. Besides,one may use sparkles, stars or cute accessories to glamourize the tattoo. Note:Make sure your needle is clean,sterilized and free from microbes. Ensure you know what you want, because a tattoo is very personal and shall be on your body. One must remember that tattoo artistry is a great talent and requires both imagination and skill. Also, before getting oneself tattooed,it is essential to think why and question if one’s ready to have something artificial on their body for however long, depending on whether the tattoo is temporary or permanent.